The U.S. Department of Defense first developed the original specifications for a military grade Circular Connector in the 1930s. Designed to meet the demands of severe aeronautical and tactical applications these were known as Type "AN" (Army-Navy). They set the standard for the range of military connectors that followed. The AN5015 connector (known as MIL-DTL-5015) and their evolutionary derivatives are often called military standard, "MIL-STD", "mil-spec" or "MS" connectors. Demanding aerospace, industrial, marine, automotive and commercial applications now use these connectors extensively. The 5015 range is a very capable military connector. It is well suited to support the reliable transmission of AC and DC power supply. However, as the smallest contact size available is size 16 it is not suitable for higher frequency signals. Such signals require a smaller size 20 contact and lower wire gauges (AWG). MIL-C 26482 and MIL-C 83273 qualified connectors were therefore developed in the 1950s to introduce size 20 contacts and overcome this limitation. As a result, lower power applications and robust transmission of higher frequency signals between systems could be supported. The MIL-C-26482 specification was, at the time, driven by the U.S. Navy and this was followed soon after in the 1960s by MIL-C-83723. These supported the differing requirements of the U.S. Air Force but were similar connectors. The rapid development of computer-controlled equipment by the mid-1960s meant that a specification supporting higher density insert layouts and smaller contacts was at the top of everyone’s lists. In the 1970s more signal capability and less power capacity in the input/output connectors of systems was a priority. Consequently, the MIL-DTL-38999 standard along with MIL-STD-1560 to determine the interface and insert layouts were developed to meet this need. These developments supported contacts down to size 22 enabling higher speed data transmission along smaller gauge wire. The introduction of MIL-DTL-38999 (commonly known as ‘38999’ or ‘d38999’) enabled reliable operation in high vibration environments. This capability is due to more robust coupling mechanisms and mating threads. For example, the 38999 series I & II have a traditional bayonet style coupling (as per 26482) and the series III has a ‘Tri-Star’ threaded coupling with an anti-vibration system in the coupling nut. These features enable both rapid coupling / de-coupling and high vibration resistance. Series I & III 38999 connectors are referred to as “scoop proof”. This feature ensures that exposed contacts of the connector cannot be touched or damaged by any portion of the mating connector. Series II, due to their low profile, space and weight saving construction are ‘non-scoop proof’. Therefore, this series is ideal for use in low-vibration, high moisture environments and where space is an issue. These developments have enabled a higher density contact arrangement of up to 128 contacts within a smaller space envelope. Above all, this means the connector is able to meet higher vibration requirements and achieve improved EMI/RFI shielding effectiveness. In addition, greater fluid resistance and environmental sealing with increased durability are also achieved. Initial design developments for 38999 were focused on meeting higher vibration requirements, improving EMI shielding, and increasing durability in fluid resistance and environmental sealing. The ability to offer lighter weight material alternatives to aluminium and stainless steel became paramount later in the 1980s and ’90s when weight and durability became a higher priority. Advances in materials have made it possible to offer a lighter-weight composite shell alternative on MIL-DTL-38999 III. 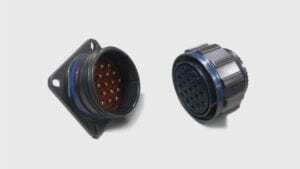 The composite series III military connectors employ military-qualified thermoplastic shells. Consequently, these shells are up to 40 per cent lighter than aluminium and have four times greater corrosion resistance, with durability that extends to 1,500 mating cycles. MIL-DTL-38999 connectors are now available with signal, power, co-axial, tri-axial, quadrax and fibre optic contacts in various shell styles. 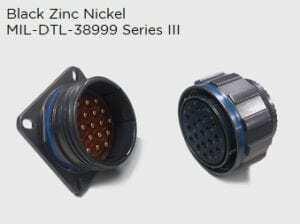 The main body (shell) of the connector is available in Aluminium, Stainless Steel and Composite material with various plating finishes. These include RoHS compatible finishes. A Nickel Aluminium Bronze shell is also available to the CECC-75-201-002 specification. There are now also a wide variety of commercial variants available. Click here or contact the team at NYK Component Solutions today for more information.